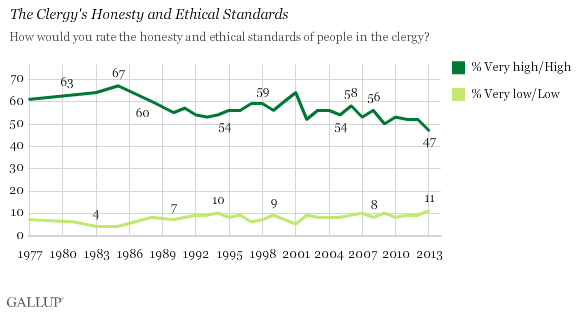 WASHINGTON, D.C. -- Americans' rating of the honesty and ethics of the clergy has fallen to 47%, the first time this rating has dropped below 50% since Gallup first asked about the clergy in 1977. Clergy have historically ranked near the top among professions on this measure, hitting a high rating of 67% in 1985. Gallup has asked Americans to rate the honesty and ethical standards of members of various professions periodically since 1976, and annually since 1990. This year's poll was conducted Dec. 5-8, and finds Americans viewing nurses, pharmacists, and grade school teachers as having the highest ethical standards. Lobbyists, members of Congress, and car salespeople sit at the bottom of the list. Since 2005, more than 80% of Americans have rated nurses as having "high" or "very high" honesty and ethical standards. 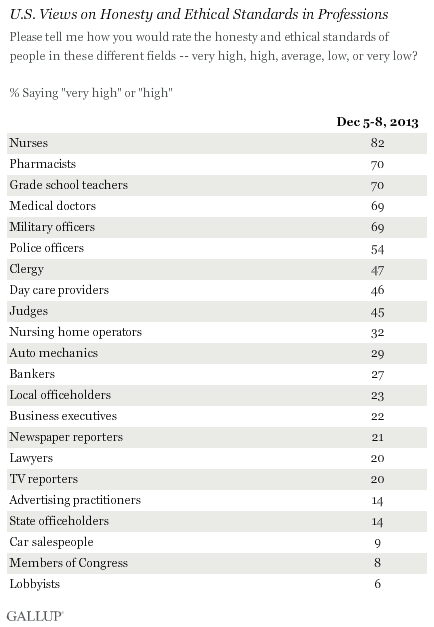 Nurses have topped the list since 1999, the first year Gallup asked about them -- with the exception of 2001. That year, Gallup included firefighters on a one-time basis, given their prominent role in 9/11 rescue efforts. In the past, pharmacists and grade school teachers have received high marks on honesty and ethics that are similar to this year's scores. This year's 70% rating for pharmacists is down from its all-time high of 75% last year. Several scandals in the 1970s involving nursing home operators rocked that industry for a time, and may partly explain the industry's relatively low honesty and ethics ratings in the late 1990s and early 2000s. However, 32% now say nursing home operators have "very high" or "high" honesty and ethical standards, up from 26% in 2010, and an all-time high in Gallup's trend. As for the professions at or near the bottom of the list, members of Congress continue to poll in the single digits, which mirrors Congress' overall approval rating in a recent Gallup poll. Lobbyists are last in honesty and ethical standards, with 6% of Americans rating them as "high" or "very high" in this regard, which is not surprising because seven in 10 Americans have said lobbyists have too much power in the U.S. When it comes to honesty or ethical standards, common stereotypes appear to apply to professions or career fields. Nurses, pharmacists, and doctors -- considered to be in "healing" occupations -- rank the highest, while the old typecast of the "used car salesman" persists, with car salespeople ranking near the bottom in honesty and ethics. Politicians -- especially those working for the federal government -- remain in low esteem, mirroring a commonly held distrust of the federal government that has developed in the U.S. in the past 40 to 50 years. This survey shows these long-held stereotypes are difficult to shake. The relative resurgence of nursing home operators perhaps shows that as scandals fade, opinions about these practitioners are rising. Yet for the most part, in the past decade, perceptions of certain career fields have remained consistent. If views of a certain profession have changed, it usually has been a function of scandal surrounding it. The Catholic priest abuse stories from the early 2000s helped lead to a sharp drop in Americans' ratings of clergy, a decline from which the profession has yet to fully recover. Americans' approval of the way Congress is handling its job dropped to 9% in November, the lowest in Gallup's 39-year history of asking the question. The previous low point had been 10%, registered twice in 2012.